A french press coffee maker is a simple, yet wonderful method to brew coffee. It makes great, flavor-rich, delicious coffee. French press coffee differs in some ways from electric coffee makers. The main difference is that the Drip coffee makers sprinkle water over the grounds in a filter-holder that then runs down to the coffee pot. However, with the french press you actually add boiling water to the grounds, stir and then let them soak in the water for a few minutes, thus extracting more of the essential coffee oils and producing rich, strong coffee. Check out here differences between the coffee press and a coffee machine. Click here to read the french press instructions. Below are reviews of Bodum® french press coffeemakers. Bodum is known as a very popular brand producing great quality french presses. I personally own two of them - an 8-cup and a stainless - and am VERY satisfied. I prefer the french press coffee much over the drip coffee makers. Keep away from children - it's hot! 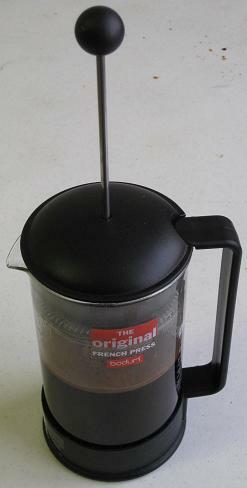 This is an 8 cup (5 oz) french press coffee maker. I use it almost daily, and I love it. It works smooth and efficient. It is handsome, and practical, takes up less space than my Mr. Coffee. With its 8 cup capacity, it brews enough for several people. If you need it only for yourself, you may not need this much capacity, unless you drink several cups at a time. Why? Because french press coffee cools really quick. It doesn't maintain the heat, so you'll need to consume it right after brewing or your coffee won't be hot. Like other french press models, it includes a pot and a lid that is one piece with the 3-part stainless steel "plunger" / strainer and the mesh filter (you don't need an additional filter; you push that down to strain the coffee. All parts are advertised as dishwasher-safe. Note: this french press coffee maker is around for about 19 to 23 bucks at the time that a write these lines. However, be aware that price may differ based on the color you chose. There are red, green and black version. This Budum New Kenya french-press, also holds 8 cups. The New Kenya has a curved plastic frame that tightly wraps the heat-resistance, borosilicate glass beaker and protects the table from its heat; the lid also is plastic. It has the same kind of stainless-steel 3-piece filter system as the other french press models. The New Kenya may be priced a few dollars more than the Brazil model. This Bodum Chambord 12 cup French Press coffee pot has a Sturdy, chrome-plated brass frame and a glass carafe. It has similar capacity as 12 cup drip coffee makers. Remember that a frenchpress will not keep your coffee hot for long, so a 12 cup coffee press would be most practical for multiple drinkers. The 12 cup unit is more pricey than the 8 cup french press coffeemakers. Do You Think a French Press is Better than a Drip Coffee Maker? Why or Why Not?